MUFF WIGGLER :: View topic - Have I made a mistake ordering from GMSN? Have I made a mistake ordering from GMSN? So I ordered a board for this Look Mum No Computer Safety Valve. I did this from a google link, however I then went to the homepage, having paid only to find that it had "GMSN! is no longer Open." in small writing under the header. Can anyone reassure me? I don't want to have spunked a tenner up the wall. You might want to go over to https://www.allthesynths.info and ask there - it's run by the GMSN guy. Although it might not help, it's a pretty dead board currently. This is a really bizarre way to close up shop. Not sure why, but it seems they are rolling up shop. IIRC, I saw some GMSN things for sale at Pusherman, but that's all gone, as is all the build info. Shame, because the quantiser looked interesting. Gotta say, it is interesting that this is exactly the situation that open source was going to prevent. Files are still up on cadlab, get them while you can I guess?! Good find, no firmware for the quantiser though. Also, I wonder how much stock resellers still have, but modular addict just posted a link to build docs which is now 404, as was the situation when the CGS site went. I certainly do not want to come across as entitled, and it is a totally different discussion, but, I do think there's a sort of bare minimum set of requirements to selling DIY projects, either commercially or as a hobby, and a lot of projects just ain't cuttin' it. Can you clarify what you mean? Are you talking about design decisions or reliable hosting or something else entirely? Oh, no not design decisions. Reliable hosting, since there might be people that still have pcb's, i know some of my projects sometimes are shelved for a while, mostly because of wiring, and I do take care to download and archive everything i can find, but still. I think if you're not soldering something when you get it, the responsibility is on you to make sure you've saved all the documentation you'll need by the time you get around to building it. Don't rely on someone else to hang on to the info you need for you. Now, if the info is gone while somewhere is still selling the boards, that's a different question, and I'd agree that in that case, it's the seller's responsibility to provide the info (though only as long as the they're selling the boards). In both cases, anything more is a nice plus, but definitely not a requirement. I think if you're not soldering something when you get it, the responsibility is on you to make sure you've saved all the documentation you'll need by the time you get around to building it. Not something I've practiced in the past but this is a bit of a wake up call! 3kGBP a month? I guess I need to recalibrate my thoughts on the DIY synth market. Rob had a bit of an argument on Facebook with the guy who runs Pusherman and asked for his stuff to be removed from the Pusherman site. Wow, yeah, fully agree with Rob in that discussion. IMHO it is a pita to simply delete the forum like GMSN did. Mostly with all the questions opened lately which were not answered or simply showing that code or circuit did not work. And the forum is of course not archived. See the second post in this thread. Reach him there.And yes, agree, he shouldn't have deleted it, or ran away from here either. FWIW, to contribute nothing useful in particular - I don't think the responsibility of providing customers "zero effort" level of documentation ends when one stops selling the product. It's a possibility one as a DIYer should be aware of and be prepared for, but not an excuse for bad service in the cases there are no serious obstacles for stopping to provide the documentation. Based on the "if you need support, reply to the order confirmation mail" it sounds like his brush with The Pusherman Spirit Of Open Source might have had something to do with it, eg. he simply doesn't _want_ to offer the documentation openly anymore. There's a link to that about 6 posts up. If there was some kind of argument in that link, it has since been deleted (or I’m missing it...but there aren’t that many comments to sift through). Yeah, looks like the comments in question were deleted. That's weird, they're gone. There are about 25 comments in that thread, but at the top it says there are 66 replies, so either they've been hidden or deleted. 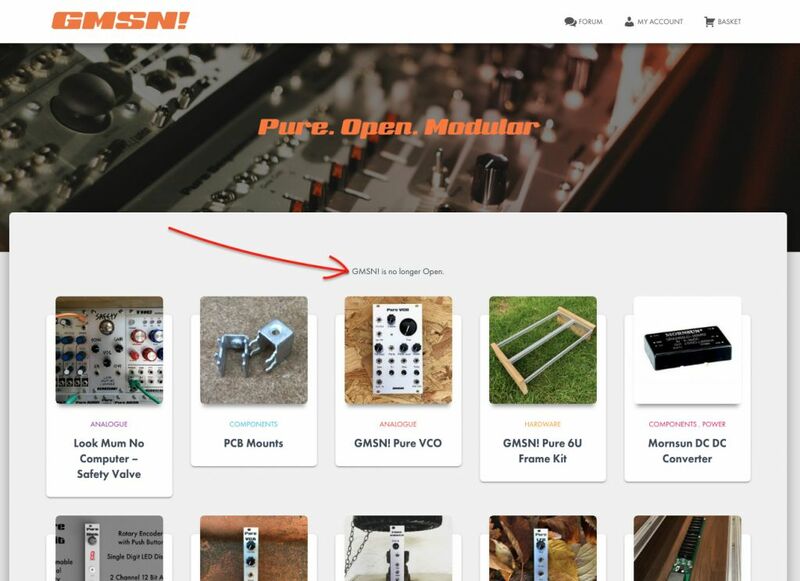 yes it seems deleted.. rob argued there about the monsoon pcb/panels being sold exclusively at pushermans until end of 2018, as it is based on open source clouds, so it should be publicly released straight away.